The PFC Donald David Mayhew Memorial Grove of native Ohio trees was designed, planted, and maintained by our students. 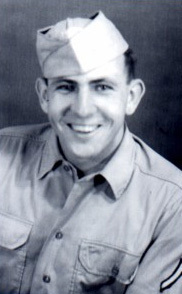 Mayhew, who had a strong passion for trees, was a former Ohio State University student who was taken from family and friends while defending our country during World War II. The Mayhew Memorial Grove was dedicated in his memory on Arbor Day in April 1999. This grove serves not only as a living reminder of Mayhew’s life and passion, but as a place of learning and respite for students and visitors. and the opportunity to work closely with faculty on research projects. A goal of the research project is to develop and disseminate information on native trees appropriate for each of Ohio's physiographic regions within the state's 88 counties – all a part of Mrs. Mayhew's wish to offer the types of learning experiences and opportunities that she had hoped her son Donald would have at Ohio State. Additionally, through her continued generosity, Helen Mayhew established the Donald D. Mayhew Memorial Fellowship Endowment. The interest income from the endowment has been used to provide student field experiences on tree improvement research and arboretum management experiences within the OSU Chadwick Arboretum. Horticulture students obtain hands-on experience and knowledge while working with and maintaining this garden setting. Not only is this a meaningful educational experience for the students, but the Donald D. Mayhew Memorial Fellowship endowment supports student workers within the Chadwick Arboretum & Learning Gardens. With her plans well in place, Helen Mayhew died September 5, 1998 at the age of 95. Her dream of keeping the memory of her son alive and providing a future for students with a passion for learning about trees is celebrated today. Visitors can stroll through the grove and see river birch, catalpas, oaks, and a variety of buckeyes that are native to Ohio. Click on Betula nigra (river birch) or Catalpa speciosa (northern catalpa or cigar tree), two trees in this grove, for a photograph and one or more links to information from The Ohio State University Plant Facts, Wikipedia, and/or USDA Plants Database. Or click Plant Search Database and simply enter the botanical name (genus only will work) of any tree on The Ohio State University Columbus campus. If you do not know a tree's botanical name, you can find it by searching the web using the tree's common name. We are in the process of adding QR codes to our plant labels throughout the arboretum. If you are walking in the gardens and see a plant label with a QR code, use your smart phone or tablet QR reader app to access a photograph and description or link to additional information about the tree. If you don't have a QR reader app, you can download one for free from your app store.